There are some insane last minute deals through AirCanadaVacations.com going on right now - There's a flight from Halifax to Turks & Caicos for $230 roundtrip after taxes. And now let's move on to Varadero, Cuba for $220 roundtrip after taxes! Search for a flight from Halifax to Varadero, departing March 16 and returning one or two weeks later. 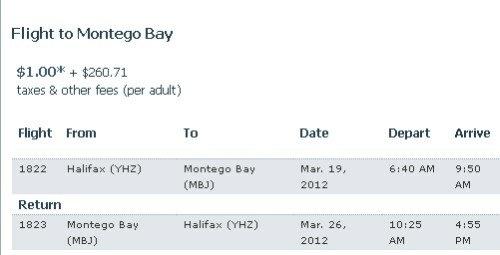 Search for a flight from Halifax to Montego Bay, departing March 19 and returning 1 or 2 weeks later. For anyone that doesn't mind an overnight layover in Toronto, you may also want to check out the blog post at the top of YYZdeals.com and replace the departure airport of Toronto with Halifax. halifax, yhz, flight deals, cuba, caribbean, western caribbean, jamaica, air canada vacations, montego bay, mbj, providenciales, turks and caicos, pls, varadero and vra.